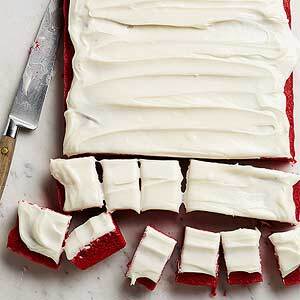 These cinnamon-spiked red velvet bars taste just like red-hot candies -- with a layer of luscious cream cheese frosting on top! Preheat oven to 350 degrees . Line a 13x9x2 inch baking pan with foil. Coat foil with cooking spray; set aside. In a large mixing bowl, combine flour, cocoa powder, cinnamon and salt; set aside. In a large saucepan, melt butter over medium heat. Remove from heat. Stir in granulated sugar until combined. Stir in eggs and the bottle of food coloring. Add butter mixture to flour mixture and stir with a wooden spoon until well combined. Pour into prepared pan. Bake for 20 to 25 minutes or until a toothpick inserted in center comes out clean. Cool on a wire rack. Prepare Cream Cheese Frosting. When cool, use foil to lift brownies from pan. Carefully remove slab of brownies from foil onto a serving platter. Frost generously, chill until icing is set, then cut into squares. Store leftovers in refrigerator. To Store: Store brownies in a single layer in an airtight container. Store in the refrigerator for up to 3 days or freeze for up to 1 month. In a medium mixing bowl, beat cream cheese with an electric mixer on medium speed for 30 seconds. Beat in powdered sugar and vanilla. Beat until well combined. If necessary, beat in milk to make icing a spreadable consistency.